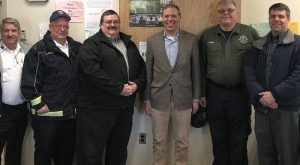 Assemblyman Will Barclay recently met with local ambulance providers who are concerned about the quality of care they will be able to provide for residents if the proposed budget is enacted. From left are Dave Butler of TLC Ambulance, Norm Wallis of Northern Oswego County Ambulance, Dave Sherman of Seaway Valley Ambulance, Lyle Robbins of North Shore Ambulance and Zach Menter of Menter’s Ambulance. Barclay and other Upstate lawmakers are urging for proposed cuts to be restored in the final budget. They recently wrote a letter to the majority leaders of the State Legislature regarding this matter. Here is a link to the letter: https://www.assembly.state.ny.us/mem/William-A-Barclay/story/85797.